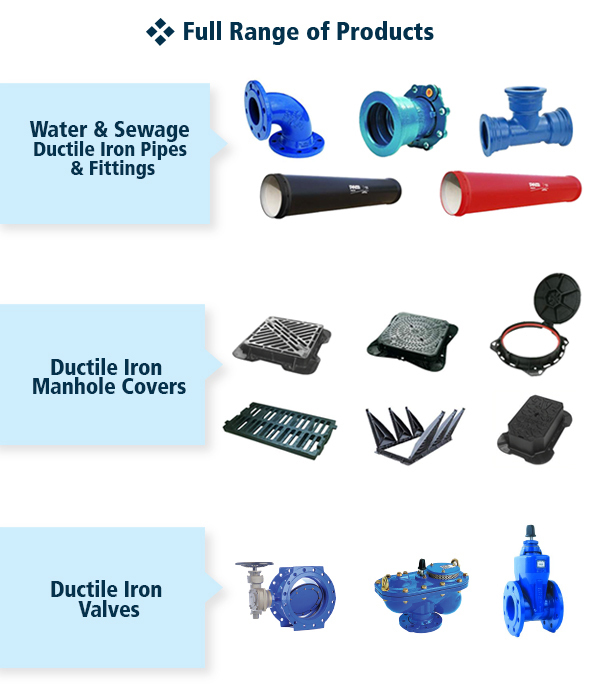 Infrastructure, a segment of Energy and Industrial Markets Group supplies Ductile Iron Pipes, fittings & valves, heavy duty Ductile Iron covers, pipe wrapping materials, municipality covers, pumps, HDPE pipes, water treatment, disinfection and chlorination systems. For the past 150 years, SAINT-GOBAIN PAM has been the world’s leading expert in comprehensive ductile iron pipeline solutions servicing over 1,000 cities worldwide each year. Saint-Gobain PAM designs, manufacturers and supplies a complete range of solutions dedicated to pipe systems for Water & Sewage, Municipal Castings and Soil & Drain. From its creation to present, Saint-Gobain PAM sets themselves above the rest by creating products that are specific to enhance the quality of water for the local population. The complete range of products include Ductile Iron Pipes, Valves, Fittings and Accessories above ground and underground Fire Hydrants according to Kahramaa and Public Works Authority (Ashghal) specifications. For over 60 years, Chase Corporation made a material difference by developing high-performance Industrial Coatings, Tapes, Adhesives and Sealants that are marketed under brand names recognized as the most trusted in their respective industries. Chase Protective Coatings Ltd. (operating as CPC) is a Chase Corporation’s operation in the United Kingdom and includes two of the best-known names in the corrosion protection and waterproofing industries, Maflowrap and Serviwrap. ( Serviwrap for Water Application Maflowrap for TSE Sewage Application). Both have proven track records and reputations for quality and reliability throughout the industry. With over 35 years’ experience manufacturing waterproofing and corrosion protection systems, CPC Serviwrap helps solve some of the most serious challenges facing the industry in a wide range of pipeline, construction, marine and industrial environments. Light, medium and heavy duty pipe wrapping *Tapes, moulding compounds *Grids *Marine Tapes *PVC pipe wraps. Covalence, a brand of “SEALFORLIFE Industries” has 40+ years of proven in-service performance. 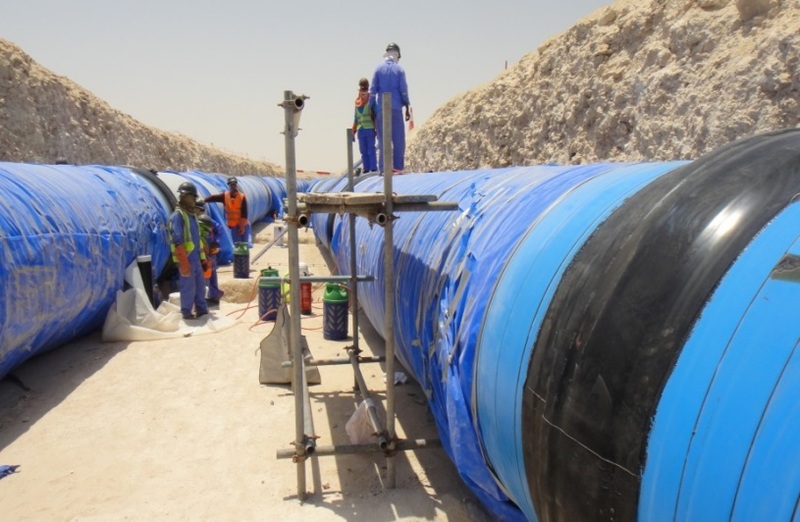 Covalence sleeves are offered PE HSS especially for Water DI pipes and fittings applications according to Qatar General Electricity & Water Corporation “KAHRAMAA” specification to protect the buried DI pipes and Fittings. Also Covalence sleeves are manufacturing PE HSS in a two-layer and three-layer construction that compliment a wide range of pipe coating applications both onshore and offshore. The Covalence DIRAX system is a patented three-layer formulation designed especially for HDD installations. Covalence also provides sleeves for sealing in the district heating and cooling markets. Covalence heat shrink sleeves meet all relevant global standards (ISO, EN, AWWA, NACE, GOST) ensuring suitability for pipeline applications and special field conditions. Covalence sleeves come in various thicknesses and can accommodate any diameter pipe. Easy-to-understand installation instructions are shipped with every product and clear product labeling allows rapid on-site identification. Gatic Civil Drainage specializes in integrated surface water management. For over 80 years Gatic drainage systems have been used to capture, control and return run-off safely into the natural water cycle. Gatic reputation as a global leader in the manufacture of engineered access covers and surface water drainage systems has been established for over 80 years. Products as detailed below include: engineered access covers, heavy duty access covers, Slot-drain surface water drainage systems, channel drainage and linear drainage. Gatic is proven in the most demanding industrial, commercial and residential projects. It includes single and multi-span machined covers in a range of surface finishes and load ratings for everything from shopping Centre to the harshest of Air and Seaport environments. Exterior surface water channels, high capacity channels, linear and slot drainage, proslot, access covers and flow controllers. Various depths and widths are available to suit all applications. GATIC innovative product Filcoten is new to the range. It is a fibre-reinforced composite which consists of mineral building materials, manufactured using water and wind power, and is 100% recyclable. The unique use of sustainable materials and manufacturing methods positions Filcoten as the clear lead in environmental design. Gatic’s in-house technical team ensures your projects benefit from value engineering, using bespoke software to link the capacity of the channel with minimal outflows. GRUNDFOS is a global leader in advanced pump solutions and a trendsetter in water technology. It contributes to global sustainability by pioneering technologies that improve quality of life for people and care for the planet. Founded in 1945 in Denmark, Grundfos has expanded its production to over 40 countries. Today Grundfos is represented by 19,000 employees in over 50 countries worldwide with a revenue above 3 billion euros with an annual production of more than 16 million pump units serving systems within buildings, industry, waste utilities, infrastructure, landscaping and water treatment. Electronic motors VFDs and pumps controls. De Nora is a leading designer and supplier of electrodes, coatings, complete electrodes, chemical solutions and water technologies to serve diversified markets. The Water Technologies division is a global organization, focused for more than 50 years’ on delivering sustainable and innovative water and wastewater technologies for municipal, marine and energy-related water treatment applications. ClydeUnion Pumps has over 140 years of experience in pumping technologies and has a rich heritage of product brands. May 2007 saw the formation of Clyde Pumps through the acquisition of Weir Pumps, a long-standing engineering company with roots dating back to 1871. Following was the acquisition of Union Pumps in November 2008, which formed ClydeUnion Pumps. The joining of these companies brought together some of the most respected products, people and heritage brands in the business including the more recent addition, S&N Pumps, who specialise in technologies for exploration and marine markets. In December 2011, ClydeUnion Pumps, became part of SPX Corporation allowing SPX to grow its network of pump expertise and operations including eight additional manufacturing facilities and 25 global service centres. The purchase of the company is consistent with SPX’s long-term strategy to expand its flow technology capabilities and establish a global platform in the power and energy sector. The ClydeUnion Pumps product range compliments the existing SPX portfolio of brands which include APV, Bran + Luebbe, Johnson Pump, Plenty and Lightning. ClydeUnion Pumps brand is known worldwide for supplying reliable and robust engineered pumping solutions stemming from over 140 years of industry expertise. Their experience spans across several complex industries including oil and gas, nuclear and conventional power generation, desalination and other key markets relevant to our product portfolio. Peštan is a leader in the Balkans in the production and distribution of products and solutions from the polymers.